For over 15 years, our marketing communications work has been recognized by our peers as award-winning – the best of the best – compared to some of the top Ad Agencies and Marketing Consulting firms in the Pittsburgh region. AMA Grand Marketer of the Year Award, Hospitality Marketer of the Year Award (2X) and more! 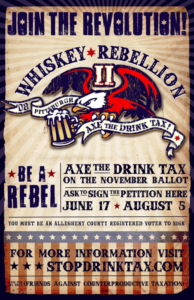 In 2008, we received the Hospitality Marketer of the Year Award from the Pittsburgh American Marketing Association (AMA Pittsburgh) for our Whiskey Rebellion II Campaign to ‘Axe the 10% Drink Tax’ in Allegheny County. In addition, we won three first place Renaissance Awards from the Pittsburgh Public Relations Society of America (PRSA) for best Public Affairs Campaign, Best Poster and Best Media Kit. In 2009, our Winter White Wedding Campaign for the Priory Hospitality Group helped it win both the Hospitality Marketer of the Year Award from the Pittsburgh American Marketing Association (AMA Pittsburgh), and the overall Grand Marketer of the Year Award – Best in Show. In 2011, our opening day press kit for Idlewild & SoakZone won a Renaissance Award of Merit from Pittsburgh Public Relations Society of America (PRSA) for best Best Media Kit. In 2013, our press kits for both Idlewild & SoakZone and the Priory Hospitality Group won a 1st Place Renaissance Award from the Pittsburgh Public Relations Society of America. That’s six first place awards in five years! 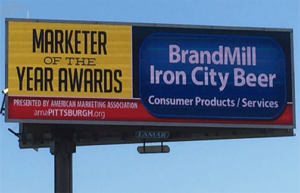 And, we won a Marketer of the Year award from the American Marketing Association for our Public Relations and sales building work for Pittsburgh Brewing – Iron City Beer! The Whiskey Rebellion II Campaign led to national media coverage by the Associated Press and Wall Street Journal and a ton of media coverage throughout the Pittsburgh region! This award winning and record breaking marketing effort helped F.A.C.T. (Friends Against Counterproductive Taxation) collect over 40,000 signatures (nearly 2X required) for a ballot vote of the people – the largest collection of Referendum signatures in Allegheny County’s over 200 year history! Our Winter White Wedding Campaign for the Priory Hospitality Group helped them increase first quarter wedding sales to over 450% and the following year over 500% with increased referrals that led to incremental sales throughout the years. We’ve taken start-up brands with no money such as the ‘In the Locker Room with Tunch & Wolf’ radio show and have made them profitable, thriving enterprises. And, it’s especially gratifying to have several clients who have been with us from the start. In short, we’re doing the right things right. BrandMill serves the communities in which we do business in a Servant Leadership fashion. For example, in addition to monetary contributions, we donate up to 10% of our hours (e.g., no fees and/or reduced fees) to help not-for-profit organizations fulfill their mission. Why? Because we’re so very blessed, it’s good business and it’s the right thing to do. And, if not us…who then? Here are just a few of the many fine non-profit organizations that BrandMill has been honored to serve over the past nine years. If you like what you’re reading and want to find out more about us, please email Stephen Wayhart or call him at 412.401.0555 today.